In response to the devastating earthquake in Bam, Children of Persia became actively involved in helping the relief efforts. Our members in Iran and the United States were able to assist various organizations both in and outside of Iran in the relief efforts. We continue to provide funds to those organizations that are addressing the educational and health needs of children in Bam. 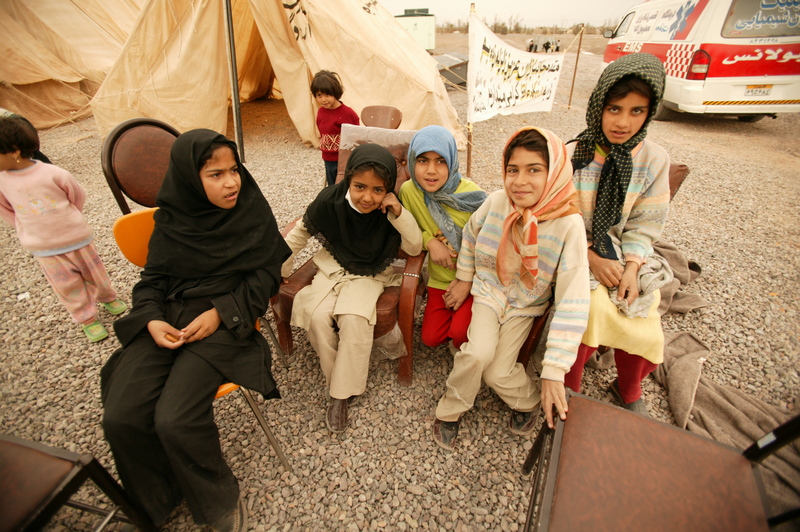 Children of Persia is evaluating the situation on the ground by contacting various NGOs and established relief organizations, including the United Nations agencies in Iran, during the first week of the disaster. We deployed Children of Persia Volunteers in Iran to Bam the second week after the disaster to provide further valuable first-hand information on the humanitarian crisis, the specific needs, and logistical coordination. We set up camp in Bam to distribute relief supplies within the affected area. Children of Persia conducted a multi-state drive to collect children’s clothing and blankets in the United States; sorting, labeling, and packaging the material donations for shipment to Iran. Between January 3-20, 2004, Children of Persia collected, sorted, labeled, shipped, and delivered 10 tons of children’s clothing and blankets to Iran. Library project: Children of Persia donated funds for the building of one library unit in Bam, which was completed by Relief International (RI). The library has been a huge success among children and adults. RI’s ground staff reports that at any one time, there are at least 35 people who are checking out books from the library. It is estimated that 70% of those using the library are children and 30% are adults. The library has received requests for more Iranian fiction and children’s books. Recently, 200 new books have been added to the existing collection. At the library, RI issues library cards to users who pay a small membership fee to ensure the future sustainability of the library. The library is also a site for educational activities. This center is staffed by two local employees (one male, one female). The center is operational between 8:30 a.m. to 11:30 a.m. and from 2:30 p.m. until closing at 5:30 p.m.
Children of Persia donated $20,000 toward the construction of the Information and Computer Technology Center (ICT) in Bam by a non-profit organization called Coalitions of Persian Charities (CPC). The ICT Center will be used to train students and teachers in necessary and up-to-date IT technology skills. The construction for this center is scheduled to start in 2006 with CPC supervising the project.